Bayard's first two novels (Fool's Errand; Endangered Species) were contemporary romantic comedies, a far cry from his third, an audacious and triumphant entertainment that imagines the post-Christmas Carol life of Tiny Tim, transformed from an iconic representation of innocent suffering ("the iron brace was bought by a salvager long ago, and the crutch went for kindling") into a fully realized young adult struggling to find his place in a cruel world. Having lost his parents and become estranged from his remaining family as well from as reformed Ebenezer Scrooge, Mr. Timothy Cratchit has found a niche in a brothel as the tutor to its madam. Haunted by his failure to connect with his father, as well as by his father's ghost, Timothy has developed a thick skin to guard against the oppressive misery endemic to 1860s London. His defenses are penetrated when he encounters Philomela, a 10-year-old waif who has been mysteriously abused. With the assistance of a singing street urchin called Colin the Melodious and a maimed retired seafarer, he pursues the source of her torment and its connection with another child whose branded body was dumped in an obscure alley. The quest becomes more quixotic when evidence points to the aristocracy, abetted by a corrupt police force, but with Philomela taking an active role, the quartet narrow in on their target. 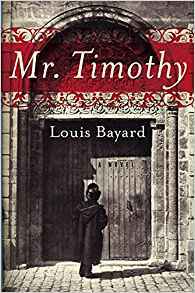 With surprising but plausible twists, and a visceral, bawdy evocation of Victorian London, Bayard has crafted a page-turner of a thriller that is elevated beyond its genre by its endearingly flawed hero for whom nothing human is alien. I had high hopes for this (my last review of 2010). But I was only partially right. I was continually not "with it" for the first 2/3rds of the book but I kept hoping it would get better. And the last 1/3 got quite good! I'm not sure what was, or wasn't missing ,or written in the first part of the book but it didn't hold my interest and I found myself not reading as much as normal with each time I'd pick up the book. I am happy to say that changed with the latter part. I went through that part rather quickly! I think there was much here to be used with old Scrooge and Timothy that wasn't brought to light, but then maybe Mr Bayard was being overly cautious so he wouldn't be said to be stealing the works of Mr Dickens. Over all this book was "good" but not great, though I do think I will give the author another shot to see if maybe I expected a little too much. Here's hoping that 2011 brings us all many good reads during the year!! Happy New Year (on Saturday) and Happy reading!!! 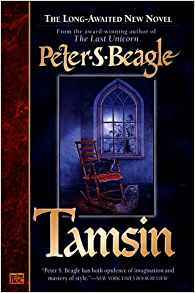 Tamsin by Peter S Beagle. Like his enchanting The Last Unicorn, Beagle's newest fantasy features characters so real they leap off his pages and into readers' souls. Tamsin Willoughby, dead some 300 years, haunts ramshackle old Stourhead Farm in Dorset, England, an ancient 700-acre estate that 13-year-old Jenny's new, English stepfather is restoring. Thoroughly American Jenny, miserable at being transplanted from New York City to rural Britain, finds a suffering kindred spirit in Tamsin, a ghost who is mourning Edric, a love she lost during Dorset's punitive Bloody Assizes under King James II. Tamsin leads Jenny through an engrossing night world inhabited by an array of British spiritsAthe Black Dog, a braggart Boggart, ominous Oakmen, the shapeshifting Pooka and a marvelous mystical army-booted Earth Mother. To save Tamsin and gentle Edric from eternal torment, Jenny faces evil personified: demonic Judge Jeffries, who sentenced hundreds of people to brutal execution during the Assizes. Slipping effortlessly between Jenny's brash 1999 lingo, the raw primeval dialect of ancient Dorset and Tamsin's exquisite Jacobean English, Beagle has created a stunning tale of good battling evil, of wonder and heartbreak and of a love able to outlast the worst vileness of the human heart. Fantasy rarely dances through the imagination in more radiant garb than this. Oh how I wish this book was Hardback instead of paperback! What a totally enjoyable book! I know why I put off reading it for so long.. just because it's paperback and the printing not the darkest nor double spaced, so even with my reading glasses it was not the easiest book for me to read. It wound up I had to read one short chapter at a time and set it back down.. but I am most happy that I finally did read it!! Looking at the cover (and before I knew better) I assumed Tamsin was the ghost cat! heh..nothing like admitting being stupid huh? lol. Of course I found out differently and loved each and every character in the book!... well.. maybe not Judge Jefferies. This was a most excellent and enjoyable book to read, and of course it makes me want to go to England even more then before! It's not about to happen but it sure makes me *want* to! I really can't give you any more description then what Amazon does, I can only say: if you haven't read this book and enjoy a good ghost story, then go get Tamsin! When writer Mee’s father died, his mother needed to sell the house and move to a smaller place—so the entire family decided to buy a zoo. Mee’s sister had seen an advertisement for the sale of the Dartmoor Wildlife Park, a small zoo in Devonshire in the southwest of England. After a long series of negotiations, licensing snafus, and the inevitable family conflicts, the author, his mother, and his brother moved into the park’s rundown house and started running a zoo. Though they owned the grounds and its 200 animals outright, they still had to pay 20 staff members, feed the animals, and upgrade the grounds. During the first week, a jaguar escaped, and the author and his brother began to realize what they’d gotten themselves into. Through eradicating the plague of rats, clearing out years of rubbish to reveal usable buildings, and battling with banks for operating expenses, the author and his staff gradually pulled the zoo back from the brink of closure. 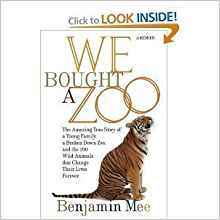 The emotional appeal of the zoo’s rescue is wonderfully limned in Mee’s practical, good-humored prose. I have to admit that I got this book for two reasons. One is was on a super sale and the other because I read the review and knew this true story took place near where Cath (Read-Warbler) lives, and I thought I might learn more of that area.. all that and I love animals so I figured it was a win-win for me. So.. the book is not what I call a page turner. But it is a true account of a family that buys a run down zoo and restores it to life. Along the way life is happening and Benjamin's beautiful wife is treated for cancer and eventually dies. This too was part of his story to tell. I felt Benjamin left out much he could have told of his children, but then the focus was to be on the Zoo, but having his wife die was too big to ignore so it had to go in the book. The "remaking" of the zoo was filmed and eventually made into a TV series called Ben's Zoo and helped launch the zoo to prosperity. It is probably, a typical life. There's adventurous things and sadness and hope and following a dream. But still it was not a page turner. It did not have me rushing to pick it up each time I sat down, but when I did pick it up I was right into it and enjoyed it. he Cowboy and His Elephant is the touching account of the incredible kindness and love shown by a real-life American cowboy toward an orphaned African elephant baby named Amy. The cowboy watched Amy grow and enjoy life until she was able to leave his ranch for the circus. Amy may have left the cowboys life, but she never left his heart. This is a story of mutual friendship, of genuine love and compassion, but, foremost, this is a story with roots that run deep in the values and traditions of the American West. I think I needed a break from the huge books I have been reading and just read something small and different from all the gothic mysteries. 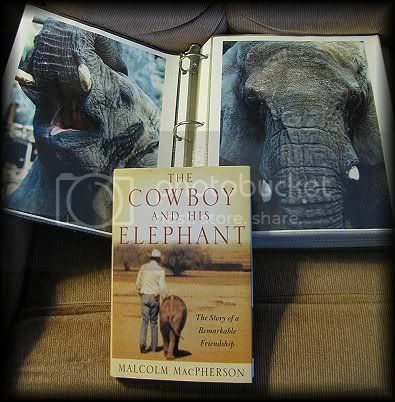 While at the used books store I picked up The Cowboy and his Elephant. It's a true story. Of course it's about a cowboy.. how as a young man all he wanted to do was to be a cowboy and her pursued it until he found his dream. Then a stranger comes along and wants to rent some stalls for, of all things, 5 baby elephants. He says they will be sold quickly but just needs a place for now and so the cowboy rents out the stalls...and the animal lover in him falls for the runt of the baby elephants, and when she isn't sold right away makes an offer to buy her. It's his and Amy's (the elephant) stories. Any animal lover will find something in this book to enjoy. Any person who is pursuing a dream of a career will come to appreciate the cowboy. It's a win, win book. When you want a little something to make you feel good.. this may well be the little book you should pick up. I know it was for me.